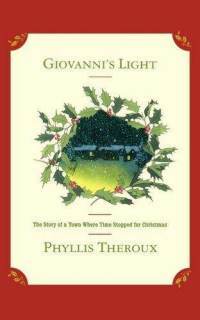 Giovanni’s Light by Phyllis Theroux is a Christmas novel with the sentiment of It’s a Wonderful Life. This fictional story takes place in a small, picture perfect town called Ryland Falls and centers on one unusual Christmas there. The book is beautifully written and the quirky cast of Ryland Falls characters are believable. I enjoyed the book immensely and plan to purchase a copy for my collection. It’s a keeper! This entry was posted in Uncategorized and tagged Books, Christmas, Giovanni's Light, Phyllis Theroux. Bookmark the permalink. Warm wishes from the Florentine heat! Thank you for your feedback. I send you my best wishes for a wonderful holiday season! Thank you Dianna! I appreciate your feedback and send best wishes for a Happy Holiday season to you and yours. Superb piece of writing. Keep up the really good performance. Wonderful entry, that everyone should see. Thanks for this entry..